Morphogenesis is a New Delhi based mid-size architectural practice established in the late 1990s. The book under review presents a collage of their work and ethos over the years. It has a foreword by Michael Webb, LA based architect. Morphogenesis presents itself as a firm with a focused interest in the sustainability agenda. This ranges from an attempt to ad-dress the key tenets of sustainability namely of environmental, economic, and social goals through Passive Design, Resource Optimization, and Contextual Identity. The presentation of works is thus divided into three parts referring to the above. A total of 26 projects are profiled. The projects cover a substantially varied programme spanning residential, commercial, mixed use, as well as hospitality, but largely institutional and office uses. The built footprint is fairly large, and the national ex-tent broad, calling for variation in response. The first section on Passive Design puts forth the need to be climate responsive and addresses the adoption of notions of adaptive comfort systems and optimized forms and envelopes. These ideas are exhibited most notably through the Pearl Academy and Infosys Campus projects, especially with their unique façade structures. The second section on Resource Optimization brings out thoughts on reducing material and energy resources. In this respect possibly the IILM Campus, The Lalit Suri Hospitality Insitute, and the British School, present holistic case examples and balanced responses to requirements, in addition to exemplifying very contextual architectural expressions. In continuation of these latter responses, the last section on Contexual Identity covers a breadth of programmatic solutions to differing cultural and social environs. The most notable of these personally is the Kumarakom Resort project, which if built with the appropriate skillset, can offer an exceptionally contextually tailored offering to visitors to Kerala. Barring a few projects Morphogenesis seems to have developed a distinctive style of reponse. A small scattering of very interesting public and master planning visions, however, also offer an uplifting outlook which is refreshingly removed from the mainstream approach of the other projects. That said, although the publication offers a broad repository of case descriptions of the profiled practice, it would have been good to see more details of the theoretical basis of architectural thinking. 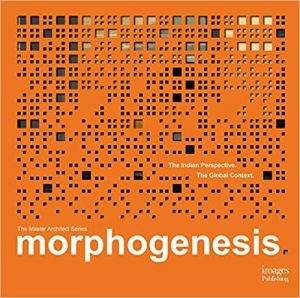 Further, Morphogenesis as a practice is known for its early research thinking on generative algorithms. Unfortunately, only a little of this is reflected in their collective of projects. It is however a pleasure to read a book on Indian architecture practices through a visually stimulating collection. Shweta Manchanda is Associate Professor of Architecture at the School of Planning and Architecture, New Delhi.